Paul Monaghan has spent many years with the Red Bull team, initially as part of their race and test engineering team but more recently as head of car engineering. He travelled with the team in his race and test roles but now spends more time back at the factory working on the car itself. He sometimes pops up at races though, and has been spotted in the team personnel press conferences. After picking up a degree in mechanical engineering, Paul Monaghan joined McLaren where he worked for a full decade. 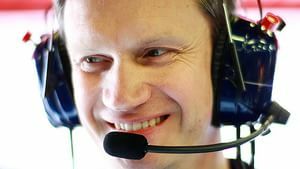 He moved to Renault, spending some time as Jenson Button and Fernando Alonso’s race engineer, and then made the transition to the Red Bull team. He joined in 2005, as Head of the Race and Test Engineering departments, a role which included plenty of travelling around to Grand Prix destinations and test circuits. Monaghan has played a big part in the success of Red Bull. Ahead of the 2009 season, he left the race engineering role and took a more factory-based position instead. As Head of Car Engineering, Monaghan was in charge of making a more seamless transition between the designs of Adrian Newey, the performance seen in the wind tunnel, and reliability out on track. The new position worked well, as Red Bull went on to score second place in that 2009 championship, and then secure four driver and team championships in a row.